Bikes have always played a large part in my life. I vividly remember each bike all the way back to my first Big Wheel1…one of the originals in the early 70s. The first monumental bike purchase for me occurred in 1982. For a year I had been working on my parents and grandparents to buy me a Honda three wheeler. I was totally consumed with the idea of having my own three wheeler…my cousin had three Honda ATVs which I loved to ride anytime we went to his house. Just as everyone was about to break down and buy me an ATV the movie E.T. came out. Remember how cool all the bike scenes were? Well, my tune changed…now I wanted a Kuwahara more than anything else. I think I could get amnesia, forget the name of all my friends and family (even my own) and I would still remember this moment. My parents and grandparents asked me if I was sure I wanted a BMX…OR would I rather have a three wheeler. Yes, they were actually (finally) prepared to buy me a three wheeler! Whoa. This should be an easy choice, right? After all, I already had a BMX bike (though a 2 ton brick of a bike), so, logically it made more sense to get an ATV. Then again, when do 12 year olds act logically? Without any hesitation at all I whole heartily stated I wanted a Kuwahara BMX bike. My parents and grandparents were no fools when it came to figuring out the financial consequence of my choice so that very day I had a shiny, chrome Kuwahara with white and blue lettering. It was gorgeous. I rode that bike throughout my middle school and high school years. And I can honestly say that to this day I do not regret my decision. If for no other reason than I surely would have hospitalized myself (if not worse) if I had a three wheeler at age 12. Certainly my memories of the Kuwara do not end there. My most memorable moment with that bike was when my friend and I built a ramp from a sawhorse and sheet of plywood. What I quickly learned about our choice in materials, as I hit the plywood, was the springiness of a sheet of plywood. I was launched halfway to the moon but fortunately landed upright without crashing (or hurting my man parts). However, I landed with such force that I blew out both tires. And while this is one of many similar stories I have with that bike, I never once ended up in the hospital. Well, at least not until I was an adult (a story for another post). Since then, I’ve had quite a few bike and while I love them all and could share many stories2 it wasn’t until the end of 2010 that I had my next monumental bike purchase. When we moved from Arizona to Oregon in 2005 I transitioned from mountain bike rider to roadie3 which I thought I would never do. I mean us mountain bikers were laid back, flannel wearing, cool kids…unlike those uptight, outfit matching, snob roadies! All it took though was a single ride with a group of local cyclists, blazing around the beautiful country side in Forest Grove and I was hooked. The first road bike I got was quickly upgraded the very next year. Not wanting to continue that horribly expensive trend I looked at cheap (at least that was the original intent) alternatives. I started getting computers and gizmos for my bike to aid in improving my performance…I was getting tired of getting left behind. Well, like most things I do I got carried away. I am very competitive…especially when it comes to athletics. I was a cross country runner during my high school and college years. And while I do some competitive running and cycling today, I really like competing with myself on a day-to-day basis and my favorite way to do that is with data. Unfortunately, simply writing down my workouts is not good enough. I want technology involved. I want data collected automatically. This is why, when I bought a trainer to train indoors I wasn’t satisfied for very long. Not only was I highly restricted on the data I could collect, it was completely manual. 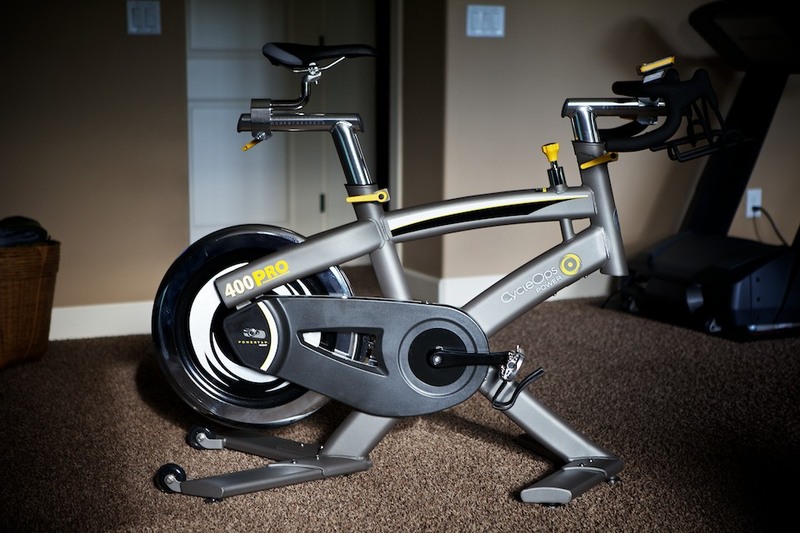 One thing led to another and soon I was determined that I needed the CycleOps 400 Pro. The amount of data the 400 Pro collects is insane. Totally for a pro, which I clearly am not. However, the geek in me won out in the end (read: miraculously convinced Denise) and I purchased the state-of-the-art machine. Months later I am still learning how to best leverage all the data. I also just recently spent another small fortunate on a setup that allows me to collect data from all my outdoor rides that I can now mimic indoors on the 400 Pro. In other words, any ride that I do on my outdoor road bike I can duplicate on the 400 Pro. You have to admit (geek/jock or not), that is so awesome, right!? To wrap up this WAY-TOO-LONG post on my history with bikes, I’d like to point out maybe the most important fact: my mom and dad still have my Kuwahara, which I intend on giving to Bryce in a year or two. Let the fun begin!